Is your child starting to speak in full sentences, but needs to take the pacifier out of her mouth every time she wants to express herself? She may be getting a little too old for her pacifier habit! Try one of our five tips to weaning (or even just going cold turkey) her off the pacifier! Conjure a little magic. Have you ever heard of the pacifier fairy? She’s a lot like the tooth fairy, in that she’ll replace your child’s pacifiers with a special gift that will help your child to forget that he’s saying goodbye to his pacifiers in the first place! Take all of the pacifiers in the house and put them into a bag, explaining to your child that you’ll be placing them outside, and going back inside to wait while the pacifier fairy comes. Replace the pacifiers with a gift when your child isn’t paying attention, and then reveal the gift and celebrate! Take it piece by piece. You may have heard that parents slowly wean their children away from their favorite comfort blankets by snipping bits of the blankets away until the “blanket” gradually becomes just a small square. You can do the same with a pacifier, snipping a small bit off the tip each day, until your child no longer finds the pacifier as comforting as she once did. Go cold turkey. 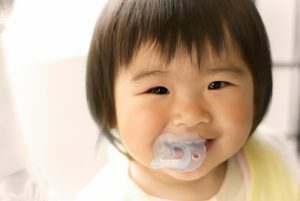 Telling your child in advance that he will be saying goodbye to his pacifiers on a specific day, plan a grand send-off for your child’s pacifiers, during which you and your child will discuss the fact that he no longer needs his pacifiers, as he has gotten to be so grown up, and then ask him to help you toss them out. A reward afterward isn’t a bad idea. Just stop buying them. Do your kid’s pacifiers get lost a lot? If you stop buying them, gradually the supply will dwindle until your child will be on her “last pacifier”. Let her know that once that one is lost, you won’t be buying any more. Find a replacement comfort object. Take your child shopping for a special stuffed animal or soft item that she can keep in exchange for giving up the pacifier. Make sure it’s an item you don’t mind her bringing with her to Kindergarten! Have you successfully gotten your child to stop reaching for the pacifier? Tell us your success story in the comments section! At Child’s World Academy, we understand the challenges toddlers and parents face as they are trying to break habits. Contact us to visit our daycare facility and learn more about how we can help make these transitions easier.